AC/DC have postponed their US tour after singer Brian Johnson was warned by doctors that he was at risk of “total hearing loss”. This is unsurprising, perhaps, given the decades that the Australian band has been pumping out the hard rock decibels. But deafness isn’t only a concern for rock musicians, or drum and bass DJs – from classical violinists to pop singers, in recent years it’s become clear that anyone around music a lot has reason to be equally worried. The largest study into noise-induced hearing loss in musicians was published in 2014. Three million Germans were examined, including 2,227 professional musicians. They found that the musicians were about four times as likely to report a new noise-induced hearing loss compared to the general population. Many studies into classical musicians have also found evidence of problems. 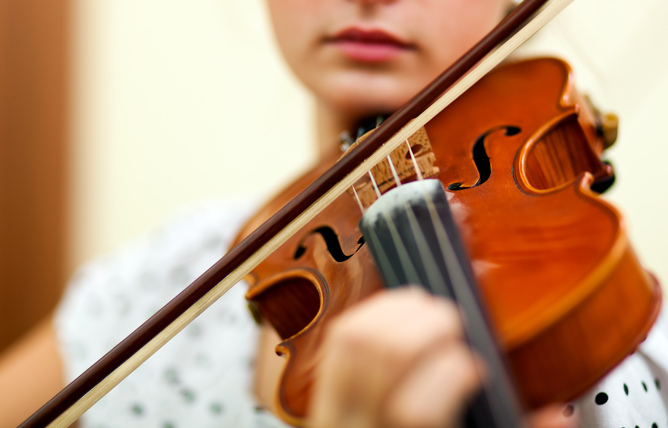 One study from the 1990s found that violinists and violists have more hearing loss in their left ear compared to their right ear. This loss of hearing is caused by the musician’s own instruments, as the violin is placed under the chin with the left ear almost touching the instrument. Five studies have found that between 37% and 58% of classical musicians experience hearing loss. For rock and pop the numbers are similar, with studies finding that just under half of musicians suffering from a hearing loss. Whether you are exposed to factory noise or listening to music, risk to hearing arises from a combination of how loud the sound is and how long you are exposed to it for. If you visit a nightclub that is thumping out music on the dance floor at 100 dB (A-weighted), then after only 10-15 minutes the exposure is potentially damaging. In a quieter part of the club, but where the music is still loud enough that you have to shout at your friends (say a level of 90 dBA), then you could be there for a couple of hours before having to worry about your hearing. In the UK, the Control of Noise at Work Regulations sets limits for exposure to noise. The lowest action level is an exposure of 80 dBA averaged over a working day; about as loud as a heavily trafficked street. When this action level is exceeded, employers must provide information and training and make hearing protection available. When the upper action level of 85 dBA is exceeded, then employers need to take action to reduce the noise and hearing protection becomes compulsory. Of course music frequently exceeds 80-85 dBA, but what counts in assessing the risk to hearing is the average exposure. One of the earliest studies into classical musicians worked with the Chicago Symphony Orchestra to measure levels during concerts and rehearsals. They found average levels ranging from 79-99 dBA. The exposure varied depending on where the musicians were in the orchestra, and it also changed with what pieces were being played. A huge orchestral work such as Berlioz’s Symphonie Fantastique will expose musicians to much higher noise levels than a small classical orchestra playing a piece by Haydn. Exposure to high noise levels often causes temporary deafness – something that many people have experienced after going to a loud gig or nightclub. While hearing usually recovers after a few hours or days, repeated loud exposure leads to permanent hearing damage. Initially, this damage is subtle and unlikely to be noticed by the listener. Problems only becomes significant in middle age when the noise-induced hearing loss combines with the natural loss of hearing due to ageing. Often, one of the first signs is when someone finds it hard to pick out a conversation in a noisy pub or restaurant – unfortunately, once that’s noticed, it’s too late. While reports often focus on the loss of hearing sensitivity, loud music can also create tinnitus (ringing in the ears). For example, one study showed that professional musicians were one-and-a-half times more likely to suffer from tinnitus. At its worst, this condition can be very distressing and lead to sleep deprivation. Fortunately, there are steps that musicians can take to reduce their risk. With acoustic instruments, one immediate threat is any loud instruments close by. In the wind band I play in, the trombones are right behind me, and these are one of the loudest instruments in an orchestra. Moving further away quietens the sound, but if that isn’t possible, then two other approaches are available. Often orchestras employ perspex screens to block sound from the loudest instruments. Alternatively, there are “musicians ear plugs”. These decrease sound without completely blocking everything out. I’ve found that these are very useful in rehearsal, but get in the way of balancing the sound in a concert (not really an option for Johnson, then). As the risk to hearing is about the average across a day, wearing the ear plugs during rehearsal only helps. Professional orchestras also look at how they schedule music, to ensure that musicians are exposed to a mixture of quiet and loud pieces (again, not really an option for Johnson). Given how loud their instrument are, drummers are particularly at risk, but using quieter practice pads when not performing, and ear plugs can go some way to lessening potential hearing loss. For rock and pop musicians, using in-ear monitors rather than loudspeakers also has the potential to reduce noise exposure, because the sound within the ear can be better controlled. Improved technology means that the number of musicians such as Johnson having to give up performing could decrease. But student musicians and wannabe pop stars need to be educated about the dangers of noise-induced hearing loss. The increasing use of headphones will also work against this – for musicians and everyone else. Unless people are careful with the volume level on their portable music players, hearing loss caused by music will increase. Prof at the University of Salford. Acoustical & audio engineering. Author and radio presenter. The uncanny valley: does it happen with voices? Did Grover drop the F-bomb? Why do we dislike hearing a recording of our own voice? How do you say scone? Do smart digital assistants really threaten regional accents? Did acoustics affect where palaeolithic cave ‘art’ was painted? Schroeder diffuser using a metasurface: new idea? Scientists are trying to uncover what makes Stradivarius violins special – but are they wasting their time? Should London’s new concert hall be a shoe-box?